support tunnel farming with drip irrigation system. The community people were suffering from a huge scarcity of the water be it for drinking, cooking or irrigating in Kot Timal village for over a decade and the earthquake in 2015 added to their woes by drying up two natural sprouts. From one sprout, each family could get a reduced water approx. 20 litres per day which they used for drinking. And for all other purposes they should buy water paying up to Rs. 2 per litre transported through rivers down the hills. It is important to mention that then Kanpur village development committee launched a program “yek ghar, yek pokhari” (i.e., one house, one pond) to tackle the water scarcity problem in Kot Timal village over 6 years back. Most of the houses could make a plastic pond using silpaulins, harvest the rain water and use in cattle rearing, household tasks and vegetable farming. However, with a passage of time, the silpaulins started to wear out and they could not store the water in the same quantity as before. As a result, they found it difficult to rear livestock and many families were compelled to sell some of them just because they could not afford to feed paying a high price for the water brought from the rivers down the hills. They could not irrigate their kitchen garden too. 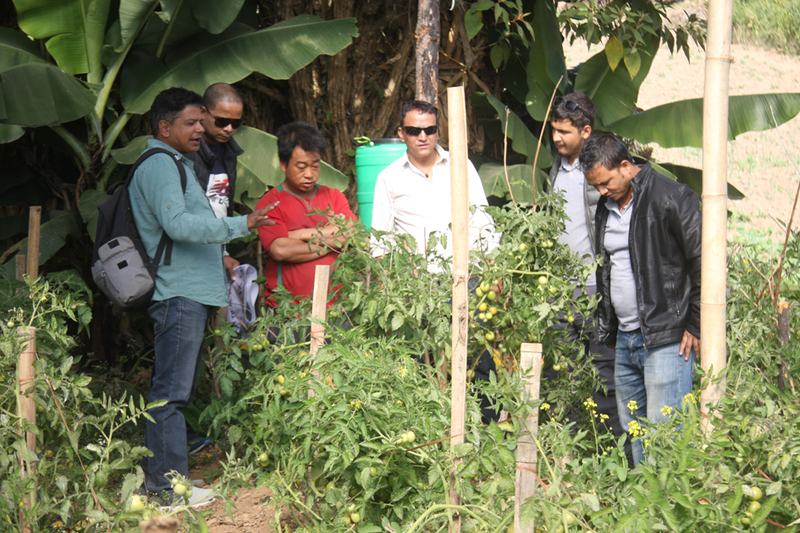 As it seemed to be difficult to continue their livelihoods – agriculture and farming, some families migrated to urban areas particularly to Banepa and Kathmandu in search of a new livelihoods option. If Pax Earth would not have intervened with the W2L project, many of the families would have been migrated from the village till now. 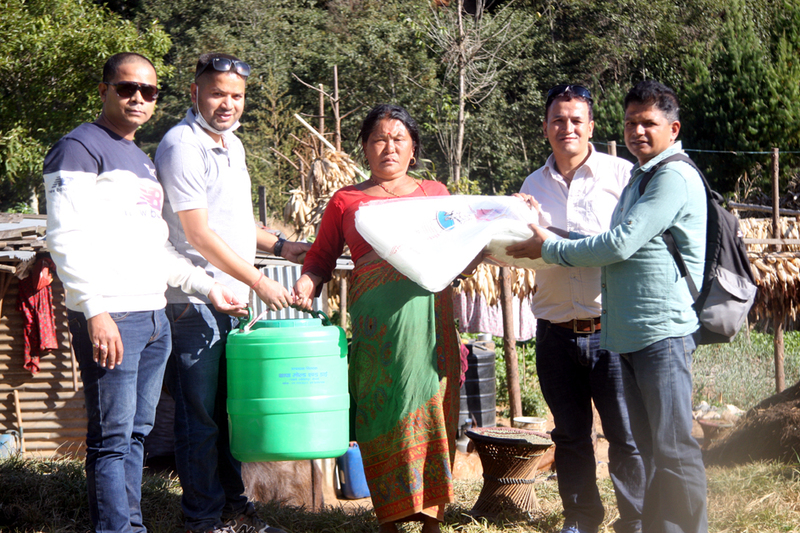 Thanks to the financial support of the staff of the World Bank Nepal Country Office and contribution of each household in the community, Pax Earth could arrange the silpaulins (size 24ft by 30ft with 120 GSM thickness) to 129 farmer households (approx. 650 community people) in May 2016. They could replace the worn-out sheets or to dig a new pit with the new silpaulins. As most of the households did have a pit, only 10 percent dug the new. These plastic ponds have a capacity to store 25,000 litres to 30,000 litres of rainwater. If there is a normal rainfall in the regular interval, they can harvest and store at least 25,000 litres of water throughout the year which is adequate to rear a few livestock and irrigate farmland connected to the plastic ponds. They can easily secure a monthly income of Rs. 10,000 to Rs. 15,000 just from selling milk. With more water harvested in the plastic ponds, we have aimed to facilitate agriculture in addition to livestock farming. From the phase-I, entire 129 families could utilise the plastic pond to sustain cattle farming while through phase-II, i.e. adding tunnel farming with drip irrigation system in the W2L project, we have just added a value to this model. They can transfer the rain water harvested in the pond to tunnel through drip irrigation system and harvest high value crops in off-seasons. These high value crops can cater a higher price in the market. The drip irrigation system needs a small amount of water comparing to other irrigation methods. The project aims to contribute to sustainable development of the Kot Timal village by improving incomes and livelihoods of the community people through sustaining livestock farming and agriculture. We launched the phase-II of the project on June 28, 2017 by handing drip irrigation kits and Silpaulin sheets to 10 farmers to facilitate tunnel farming with drip irrigation system. We handed high quality Silpaulin sheets (size 6m x 12m with thickness of 90GSM) and drip irrigation kits (5 lines) with a capacity to plant 100 crop seedlings in tunnel. Our aim is to help each household secure a monthly minimum income of Rs. 15,000 from selling milk and vegetables under the W2L project. The Pax team could observe the outcome of the tunnel farming during the field visit. Out of 10 beneficiary farmers, 5 farmers involved in producing tomato seeds, 4 farmers involved in cultivating fresh tomatoes and one farmer could not initiate due to some personal circumstances. Aggregate data of the production, sales and income from the tomato cultivation till November 2017 of each beneficiary is presented in Table 2. Each farmer family planted 100 tomato seedlings in July and harvested from September 2017 through November 2017. The farmers involved in seeds production could produce in the range of 300gm and 500gm. 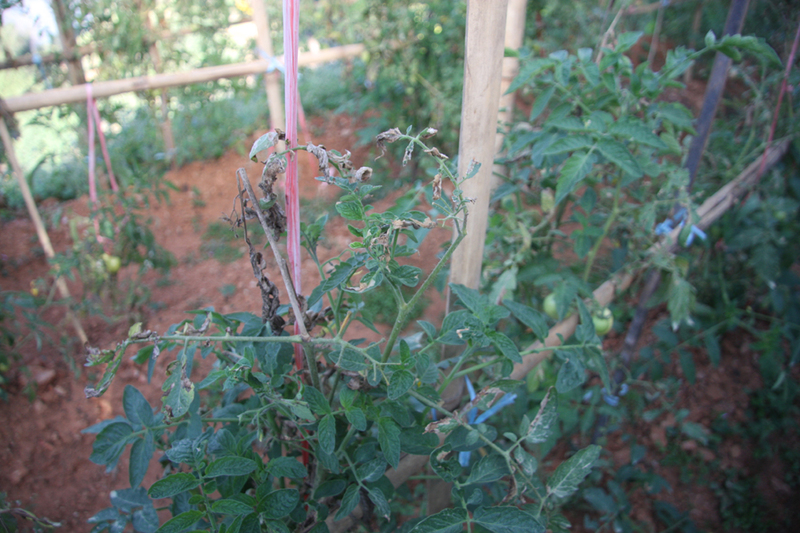 They could have harvested more in quantity but the dangerous disease “Tuta absoluta” attacked their tomato plants before they could harvest in full potential. Once the Tuta absoluta attacks, the plants need to be destroyed completely. If there was no Tuta absoluta attacks, they could have harvested about 800gm to 1Kg seeds. They could sell the seeds at Rs. 78,000 per Kg in the local market. Hence, the farmers could earn in the range between Rs. 23,400 and Rs. 39,000. Similarly, the farmers involved in fresh tomato cultivation could harvest in the range of 185Kg and 435Kg and sell in the range of 165Kg to 410Kg. The average selling price of tomatoes during September and October was Rs. 50 per Kg. 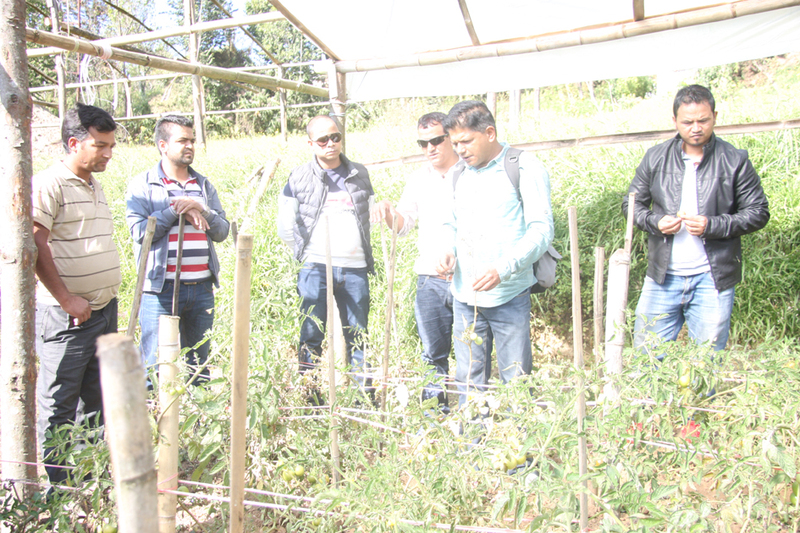 However, the flash flood in August destroyed many hectares of tomato fields in Terai region which led to a less production resulting in a high demand in the market in Kathmandu valley. The price of tomatoes could even reach at Rs. 100 per Kg in November. Hence, in aggregate, the farmers involved in fresh tomato cultivation could earn in the range of Rs. 10,000 and Rs. 19,100. The outcome of the seeds production in tunnel is satisfying but the fresh tomato cultivation could have been better. Despite providing key technical advises in the orientation program, some of the farmers were found ignorant particularly in irrigating, fertilising and staking leading to a less production. Two of 4 farmers’ fresh tomato cultivation was harmed by Tuta absoluta. The ongoing reconstruction of the houses in place of the earthquake damaged houses did keep them busier rather than in the farm as reconstruction work has been their top priority post-earthquake. The gap between the orientation program (March 2017) and seedling plantation (July 2017) was over 3 months which also played a part the farmers forgot key technical advises. Our technical advisor Rajan Gaire has advised how to tackle Tuta absoluta and other issues while interacting with the farmers during the field visit. We aim to address other issues by organising a comprehensive orientation program at least one week before the next plantation. The next plantation may occur in between mid-March 2018 and mid-April 2018. Hence, we will organise a comprehensive orientation program at the Kot Timal village inviting some experts in March 2018 and follow up programs in a regular interval then after. We will also develop a mechanism to connect the farmers with the experts through mobile or social networks so that they can be in regular touch and can tackle any issues regarding their farming in time. Besides, we will encourage regular conversation between beneficiaries so that they can tackle some issues with the skill(s) of each other. We aim to add 12 to 22 more farmers in this project by the end of February 2018. We hope that 35 to 45 farmers will be an ideal size to support and observe the result. A beauty of this project is the economic participation of the community people. Each beneficiary household has contributed Rs. 1,500 for this project in addition to preparing bamboo tunnel structure and field for plantation on their own. When we initiated the project, we did not imagine that the project would benefit the community even more. We later realised that the project has helped them to construct the new houses to replace the earthquake damaged houses and to improve sanitation in their homes with the availability of regular water in the pond. We are happy to share that over 30 houses have already been constructed utilising the water stored in the ponds and some are under-construction. Hence, the benefits of the W2L project are manifold. This livelihoods project is not only supporting these farmers recover from the earthquake damages but also empowering the community for a sustainable development.